On Monday, August 6, 1945, the nuclear weapon Little Boy was dropped on Hiroshima by the crew of the American B-29 bomber Enola Gay, directly killing an estimated 80,000 people. By the end of the year, injury and radiation brought total casualties to 90,000-140,000. I was not alive then and am not going to judge the people who made the fateful decisions that led to this horrible event. I am going to say that all of our decision makers of today need to think about what happened here and in Nagasaki, and ensure that something like this never happens again. Do I hold out hope that this will be the last time we ever see something like this happen? Of course I hope something like this never occurs again, but I am a realist, and on that day we crossed a line. 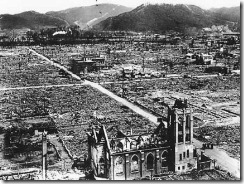 Seeing what happened in Hiroshima did not stop us from doing it again in Nagasaki, did it? We keep hearing governments and special interest groups say that we will never let there be another Holocaust, yet we have genocide happening all around the world. Things always seem to be easier the second, third and fourth time around. I guess the only real hope is that we as humans find a way to make peace as profitable as war. Sorry that this post is such a downer, but sometimes we need to see how bad thing can get before they can get better. 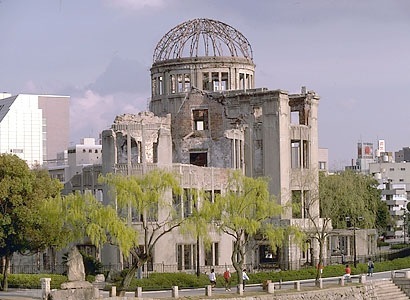 I will leave you with this photo of the Hiroshima Peace Dome. This was one of the few building that survived the explosion. Hopefully we can look upon it and work to make sure this never happens again.